Sometimes, three outs are all you need. That was enough for Nikolaus Teichert, who just jammed when he was dominated but spiked a deuce on the river to make two pair and eliminate Vincent Maglio after just 26 hands of heads-up play here on Day 4. The pair began heads-up play last night, but were unable to conclude the tournament, and play was suspended until today. Teichert, who had taken momentum and a chip lead late last night, continued his surge from the start of Day 4 and never let Maglio get anything going. Teichert, who sports a modest $211,772 in live cashes, more than tripled that with his $730,756 win today. 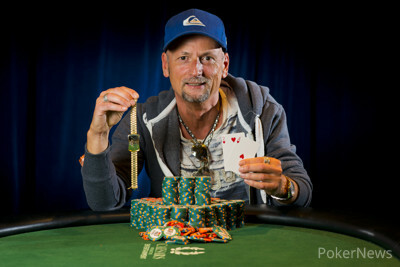 Of course, he also claimed a World Series of Poker gold bracelet for his victory. Thanks for tuning in to PokerNews' coverage of Event #56. Don't miss the live coverage of the $50,000 Poker Players' Championship, which is about to begin. Hand #144: Nikolaus Teichert got a walk. Hand #145: Teichert limped, Vincent Maglio checked. The flop was , and Maglio bet 125,000. Teichert called. The turn was a , and Maglio continued betting, this time 275,000. Teichert called. A fell on the river, and Maglio checked. Teichert checked behind. Teichert won with a pair of tens. Hand #146: Maglio limped, and Teichert went all in. Maglio folded. Hand #147: Maglio bet 150,000 on a board of . Teichert called, then both checked the . Maglio won with . Hand #148: Maglio limped, Teichert checked. The flop came , and both checked. The turned, and Teichert won with a 300,000 bet. Hand #149: Teichert limped, Maglio jammed, and he won the pot. Hand #150: Maglio raised to 240,000. Teichert jammed, and Maglio instantly called. The flop came , leaving Maglio well ahead but opening up some chopping outs if the board paired low. A turn changed nothing. The dealer burned and turned a river, and Teichert's two pair won him the hand and the tournament. 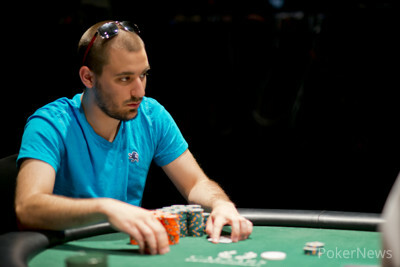 Hand #141: Nikolaus Teichert raised to 245,000 and took the pot. Hand #142: Vincent Maglio completed the small blind and Teichert checked his option. Both players checked the flop. Teichert check-called Maglio’s beet of 150,000 on the turn. Teichert check-called Maglio’s river bet of 375,000 when the came. Teichert takes the pot with a pair of queens. Hand #143: Teichert completed the small blind and Maglio checked his option. Both players checked the flop. Maglio led for 150,000 on the turn and Teichert called. Maglio led again for 325,000 on the river and Teichert again made the call. Maglio turned over for a pair of queens and took the pot. These hands were lost due to technical difficulty. Hand #125: Teichert raised to 435,000 and Vincent Maglio folded. Hand #126: Maglio raised to 250,000 and Maglio released his hand. Hand #127: Teichert folded, giving Maglio a walk. Hand #128: Maglio completed the small blind and Teichert took his option and raised to 270,000. Maglio called and the flop was dealt. Teichert bet 200,000 and Maglio called. Teichert checked the turn and Maglio bet 450,000. Teichert folded and Maglio took the pot. Hand #129: Teichert raised to 240,000 and Maglio reraised to 600,000 causing Teichert to send his cards to the muck. Hand #130: Maglio called on the button and Teichert checked his option. Teichert check-folded to Maglio’s bet of 125,000 on the flop. Hand #131: Teichert completed the small blind and Maglio took his option to raise 320,000. Teichert made the call and the flop was dealt. Both players checked. Maglio check-called Teichert’s bet of 400,000 on the turn. Maglio checked the river and Teichert bet 650,000. Maglio called and Teichert showed tens full of kings while Maglio mucked his hand. "Please Shuffle Up and Deal"
The tournament supervisor has politely asked the dealer to begin the tournament. Today starts where yesterday left off, with heads up play between Nikolaus Teichert and Vincent Maglio. Play concluded yesterday after ten levels when Teichert decided against extending play for an additional level. The heads up match began with the players nearly even in chips but Teichert comes into today sporting a slight lead with 7,620,000 to Maglio's 5,415,000. 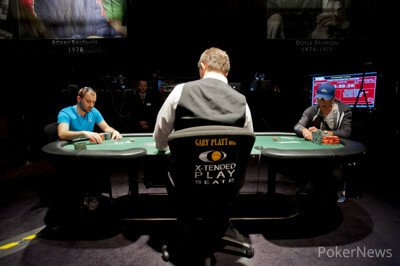 Both players have their eyes on the first place price of $730,756 and the World Series of Poker gold bracelet. It would be the first bracelet for either player with this being the first WSOP cash for Teichert and the second for Maglio. Resuming play after a good night's sleep, should prove for an interesting day on the felt. Play resumes on the secondary feature table at 1 p.m. local time. 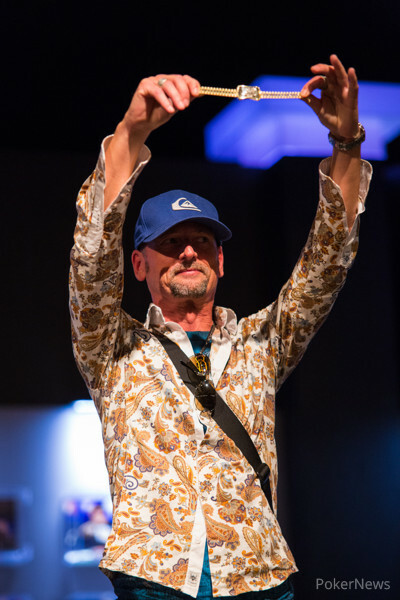 Stay with PokerNews for continuing hand-for-hand coverage as the newest gold bracelet is awarded. While you are waiting for the action to begin, make sure and get caught up on all the lastest news from the WSOP with Kristy Arnett and your July 4th Update.